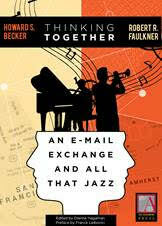 Thinking Together: An E-mail Exchange and All That Jazz is one of the most revealing records of a scientific collaboration ever made public, and an intimate picture of the creative process. Collective creativity—making sparks of originality produce something more than a glint in someone’s eye—intrigues sociologists, people who study communication and theorists of business organization. The collective part of that process, turning an idea into a finished product, is even more complicated, and in Thinking Together, readers can watch the authors go through all the complications of working together to make the final result happen. The e-book also includes more than 200 video click-throughs to songs that authors and renown sociologists Howard S. Becker and Robert R. Faulkner discuss.